This Christmas we received a wonderfully generous gift from Brent's Grandmother. (And an unexpected not so welcome one...more on that later.) 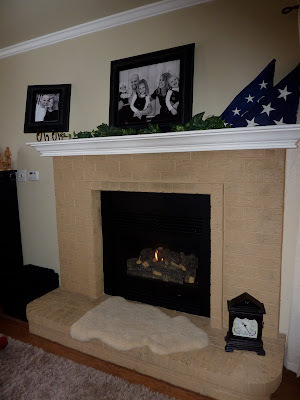 Thanks to her magnanimous gift we were able to install a gas fireplace in our front room. We have a great front room but it is almost unbearable when the temperature drops below 30 outside. It is far too drafty to be comfortable. For 5 years, I have longed for a place to go and get warm in my house. Finally, thanks to Grandma I have it! We love you Great Grandma. Now, we also invited something besides the cozy, warmth of fire into our house through this little addition. . . . About 30 minutes after the installers left they started to appear. Mice. They must have had a snug little home behind our old firebox and now they were on free reign of the house. Our Christmas tree is next to the fireplace and became their first refuge. We spent several hours with lots of screaming (by myself), tennis racket whacking (by Brent, and he got 2 this way), and mouse-trap setting and snapping. I think we killed 5 mice in 3 hours. 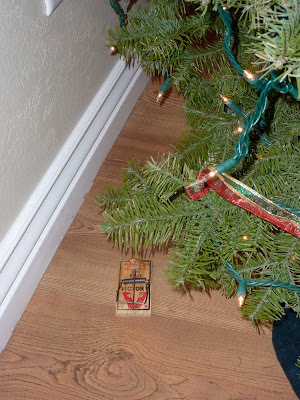 Well we had a trap strategically placed behind the Christmas tree. Little Callista decided to do some exploring after the main mouse hulabaloo had subsided. In her words here is what happened. "And so mom, I looked behind the Christmas tree and I saw some pomegranate juice everywhere. But I didn't know. So I kept looking and then I saw the bloody mouse. It wasn't pomegranate juice. I'm glad I didn't try some." If that doesn't make your stomach turn you have a far stronger gut than me. We had a splattering of mouse blood eerily similar to the refreshing spray of juice as you crack open the pomegranate. Mmmmmm. Eat up! Love the new fire place, how exciting!!! I'm sorry bout the critters, but the juice story is pretty funny!